Last week, we noted that documents filed as part of the ongoing lawsuit between Apple and Samsung had revealed a few images of early iPhone prototype designs, including some that revealed similar design to what ultimately appeared years later as the iPhone 4/4S. 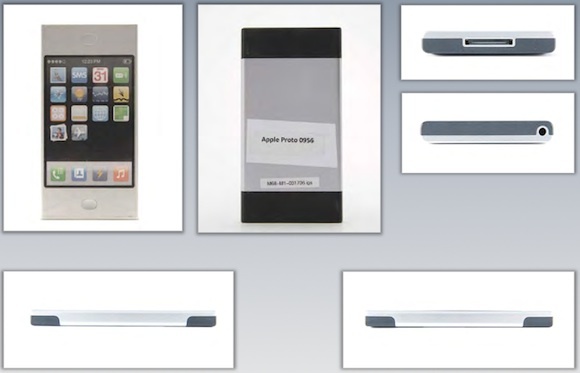 AllThingsD has now put together a gallery of dozens of images from the court documents showing even more of Apple's ideas for the iPhone and iPad. 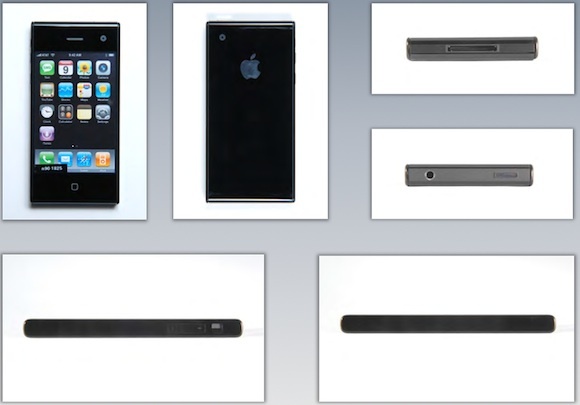 Among the many filings on Saturday was a document with dozens of sketches and prototypes for both the iPhone and iPad. Some had already been included in earlier filings, but Saturday’s collection was particularly extensive. The filing features a host of sketches, images from computer-aided design programs, and photographs of actual models that Apple fabricated as part of its design process. Among the concepts that had previously surfaced was a series from Apple's Shin Nishibori, whose early Sony-inspired designs were immediately leapt upon by Samsung as evidence that Apple had copied the iPhone design from earlier innovators. 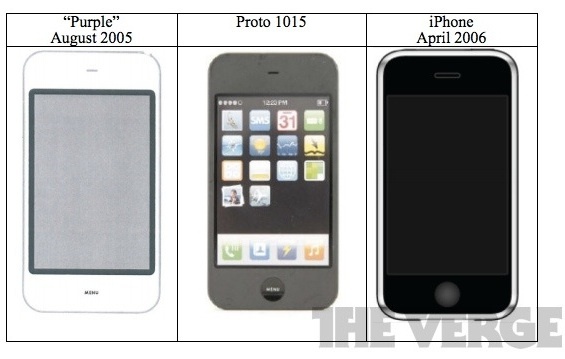 But as noted by The Verge, additional prototypes dating even further back show that Apple had the iPhone aesthetic well in hand even before the Sony-inspired designs were created as a side project. "Purple" dates back to August 2005 — months before the Jony prototype was originally designed. According to the documents, Shin Nishibori's Sony-style touches were simply "an 'enjoyable' side project," embellishments on a concept Apple had already designed. The documents contend that Purple remained free of the alleged Sony inspirations, ultimately giving birth to the iPhone in 2006 (and looking decidedly like the iPhone 4). AllThingsD is keeping a close eye on all of the trial developments, with Ina Fried tweeting from the courthouse today to provide updates on important developments in the high-profile case. And to think people compare the Zune to a brick. Yes, but the difference is, Apple held back on releasing a brick. Microsoft didn't know to do that. i feel like i'm seeing the same rumors every week. Except you are replying to a thread that is discussing old iPhone prototypes with regards to their lawsuits with Samsung's recent offerings. Not the same as current iPhone Prototype leaks we are seeing online in recent news. Samsung : "We sold millions of copies of your designs but at one point during R&D you maybe thought about copying a Sony design..."
Still it'll be pretty interesting to follow the suit to see the numerous ways this will become a train wreck. There's a difference between companies getting inspiration from each other and blatant copying. You get inspired by something and you still make it your own thing in the end. I don't see that with the Samsung phone below. And based on all these prototypes being leaked it's obvious there isn't only one way to design a phone. Plus the Galaxy S III looks nothing like an iPhone, so Samsung is capable of doing their own thing when they want to. Looks like Sony should sue both of them. Nope. The "purple" design antecedes the "sony inspired design", so it's now obvious Apple didn't copy Sony. Furthermore to all those that claimed the iPhone was copied from other designs, like the LG Prada, they now have been proven wrong with the 2005 "Purple" design.